Evolution of a Foodie: Guacamole! 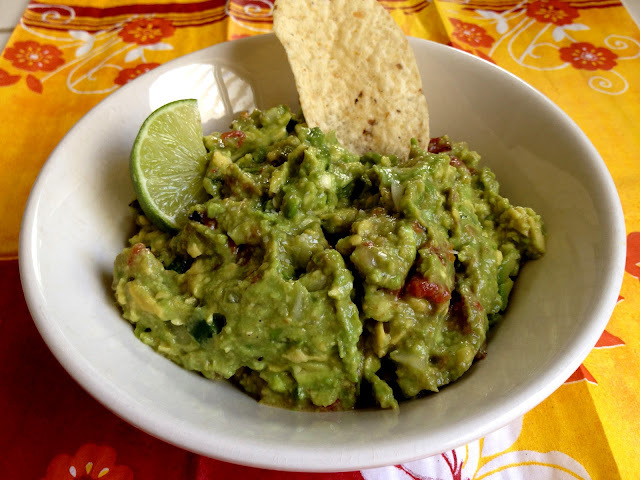 Guacamole is one of my go-to favorite easy snacks to make. If I don't want to cook something, and we happen to have avocados and tortilla chips laying around, odds are we have the rest of the ingredients! Super easy the way I make it, and very tasty! Sometimes I mix it up and make some pico de gallo to add to the mashed avocados, other times I take the simple route (which is my go-to recipe) and just use some pre-made salsa, and jarred jalapeño slices. This will make enough guacamole for one or two people, depending on your avocado size and how hungry you are. You can always double or triple the recipe for more people. 1. Cut avocado in half, remove pit. Take your knife and make a criss-cross pattern in the avocado, before removing it from the skin. Scoop avocado dices out with a spoon into a bowl. 2. Season with Kosher salt. Juice half (or the whole) lime into bowl. Mash avocado until desired consistency. 4. You can add some diced onion and pico de gallo in place of salsa if you wish. Mix together, then serve with tortilla chips.